Limited operations are now being conducted at the following RCAF sites: Lac St. Denis, Mont Apica, Foymount, Edgar, Chatham, Parent, Senneterre, and Falconbridge. The Chatham site was accepted 26 Oct 53. Installation work at Holberg was scheduled to start 12 Nov 53. The following sites have been accepted since the last issue of this report and are now engaged in limited operations: - Armstrong (C-15), Puntzi Mountain (C-19) and Saskatoon Mountain (C-21). Acceptance at Sioux Lookout (C-6) is expected 20 Nov 53.
a - At St. John’s (N-22), (GCI) work on the stationary portion only of the 6B Tower was scheduled to begin this month. Work is proceeding on both the stationary and rotating elements of the 6B Antenna at Stephenville. At Goose Bay installation of both the stationary and rotating elements of the tower has progressed to the point where preliminary testing of electronic components has commenced. Acceptance of Gander is expected 13 Nov 53. St. Anthony, Cartwright and Hopedale are ready for acceptance. Saglek and Frobisher are expected to be accepted by 15 Dec 53.
b - Newfoundland Tail Cables - Engineering plans for tail cable work have been completed and material delivery is progressing. Construction is under way but a possible slippage of 30 days or more is anticipated in the previously noted estimated completion date of Dec 53.
c - Carrier System - Canadian National Telegraphs were notified on 5 Nov 53 of their receiving the overall management contract for the carrier system in Newfoundland. Choice of equipment is not yet finalized. d - Microwave - The management contractor has issued Letters of Intent for the 2000 mc. Equipment to Canadian General Elextric Company and for the 400 mc. Equipment to Canadian Westinghouse Company. The issue of Letters of Intent to Canadian Marconi Company for the supply of antennae, feeders, systems alarms etc., is expected immediately. Letters of Intent have also been issued to Canadian General Electric Company for multiplex equipment and to Federal Electric Manufacturing Company for telegraph carrier, terminating sets, ringers etc. Power equipment has also been detailed and ordered. Construction is underway at sites 117 and 118. 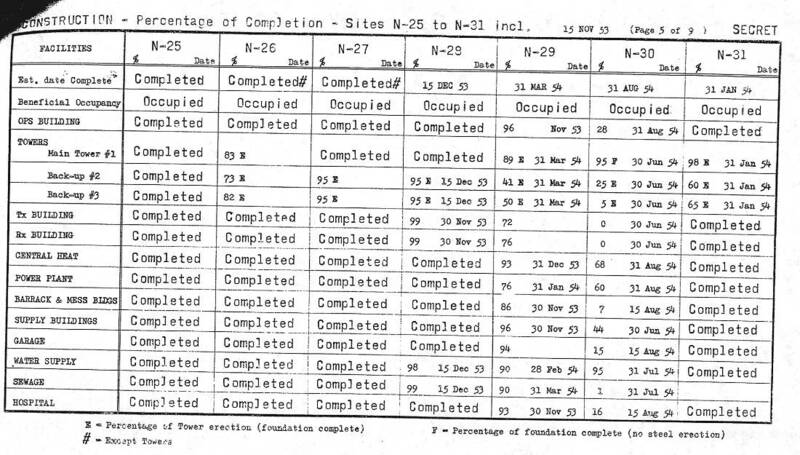 These sites will be used for operational suitability tests and are expected to be completed early in 1954. Design work is underway on buildings, towers, feeders, ropeways, wharves, etc. Detailed field surveys of all sites excepting those located at the radar stations have been completed. 5. R.E.P. TELECOMMUNICATION EQUIPMENT - Due to the fact that most of Pinetree telecommunication equipment has been shipped or delivered, the detailed table headed "Major Equipment Availability" has been reduced to the following: - (Equipments not listed have been delivered). AN/CPS-6B - Production, shipment and delivery action to all five sites is being carried out to meet present limited operations dates. AN/FPS-3 - All seventeen have been delivered, with the exception of some minor deficiencies which should be shipped by the end of the year. These will not affect installation for limited operations. AN/FPS-502 - Production scheduled for Aug 54 through to Dec 54. AN/TPS-502(10D) - Prototype tests are nearing completion and one production unit is expected in Dec 53. AN/GGPA-(?) - (Video Mapping Unit) - First unit Nov 53 and rate of five per month thereafter. First 12 allocated to Pinetree; remaining units for Pinetree allocated on 50/50 basis Canada-USA. AN/GPX-(502) - This IFF equipment will be supplied to manufacturer of AN/FPS-502 by USAF, to be fitted and delivered with that radar. DE-ICING AND PRESSURE, EQPT. FOR 22 FT. RADOMES - (used in Type 30 towers except at Ste. Marie and Halifax) - De-icing Equipment (RCAF prototype) has been approved and Pinetree Project Office is processing necessary information required by Department of Defence Production (Canada) to begin procurement action. Pressure Equipment - first production model shipped to Ramore second week of Nov 53 for prototype installation. RADOMES - (22 ft. and 50 ft.) 22 ft. radome delivery has started. 50 ft. radomes delivered with radar and depot spares are also being shipped. NE-612 - All fifteen plants shipped. NE-611 - Two completed and shipped. Remaining three to be ready by end of Nov 53. NE-603 - One already shipped to Ste. Marie in May 53. (This was omitted in error from last two reports). Other to be ready Nov 53. NE-618 (for ADCC) - Portion of main frame shipped in Sep 53. Partial and progressive shipments of equipment to begin last of Feb 54 and to be completed 15 Apr 54. AN/FRT-503 Cabinets and Air Conditioner Units - Delivery not expected until Dec 53 or Jan 54 on 20 cabinets and 11 air conditioners (blowers) still outstanding. TMC-DDR-2 Receivers - Thirty-one delivered. Remaining eleven to be ready by 30 Nov 53. Recorder-Reproducer Sound - No contract as yet between USAF and Canadian Commercial Corporation but detailed requirement has been passed to USAF for contractual action. Operating spares have been delivered or are in transit to all sites in quantities sufficient to maintain limited operations. Remainder of operating spares required for all those equipments shipped should be completed by 1 Jan 54. Nearly all depot spares for equipments delivered are either ready for shipment or are in transit to depots, with the exception of those for the AN/FRT-502 and AN/FRT-503 which are scheduled for Jan 54, and those for the CR-91A which are to be completed by the end of Nov or in Dec 53.
of relative progress on sites and their capability of operating in a limited capacity. 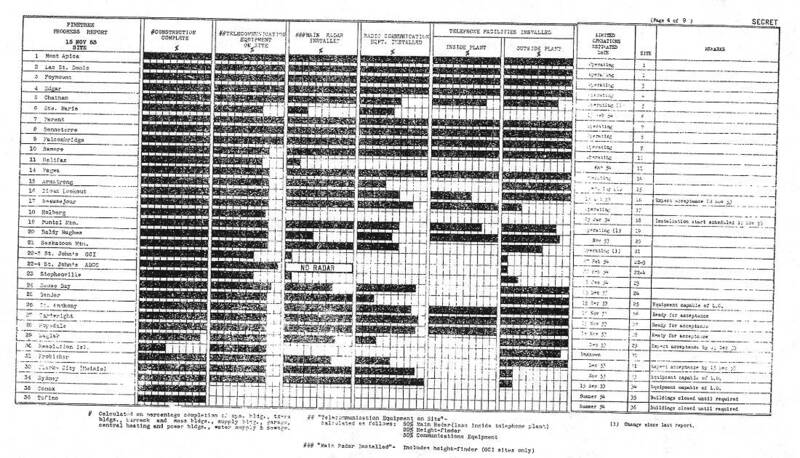 Because of the necessarily general content of the chart the impression may be given that a site is fully completed, yet in reality final completion may require several weeks insofar as full communication facilities are concerned. Back-up radar and height-finder radar will not be installed for many months and it will be possibly two years before NEAC microwave communications are fully installed.